Is it that time already? Why yes, yes it is. Most people who find and read this know, but NDK stands for Nan Desu Kan and is one of the local anime conventions that my friends and I attend. We always manage to have a good time and we make our own costumes. All around good fun. I am excited to announce that the Sailor Moon/Disney cross over is happening this year! And we have a pretty big group involved! I am going to be Sailor Princess Jasmine. Is that how we should write our names? Sailor Jasmine? Anyway, it is going to be fun! I am hoping that we bring back our Katamari group costumes. I don't know that a decision has been made. I am planning on bringing back my Lady Doctor costume as my alternative. Because I love it. I also think that I want to make a Hiccup costume. I probably will--I think it will be easy enough. So the Jasmine scout costume will be the most difficult on so many levels. First off, my skin color is pale. Some of my friends would tell you that I am so pale I am almost blue. This brings a whole new problem: should I try to tan or color my skin so I look more Jasmine-like? (I am thinking no.) Also, I don't want to bare my midriff. So my plan was to find a skin colored leotard and make my two piece costume over it (so my midriff is covered). After not finding anything in my skin tone, I finally found a leotard that was the color of Jasmine's outfit and decided that I will cut out the middle and add in a mesh or something. I also ordered tights that looked my skin color. If they are too dark, I will dye them. I found it all pretty cheap online so I can justify having to alter them. Plus, covering my midriff and wearing tights will cover two of my tattoos. And then I don't have to do so with makeup. I will certainly need a wig. I looked a little online and found some truly terrible Jasmine wigs. That will be another hurdle. We have already had a meeting to start planning our Sailor Disney costumes. 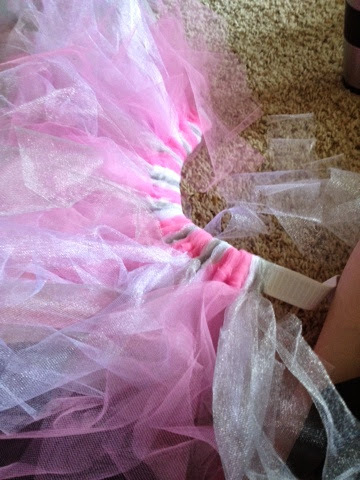 We know how we will be making our skirts and our bows, more or less. We even have tiara patterns and everything. I will post more about these as I get into it. I need my leotard first so that I can match my colors. I am excited! Like pink, fluffy clouds! We are dorks and I love it! I just need to finish it up and paint a shirt and headband to match!